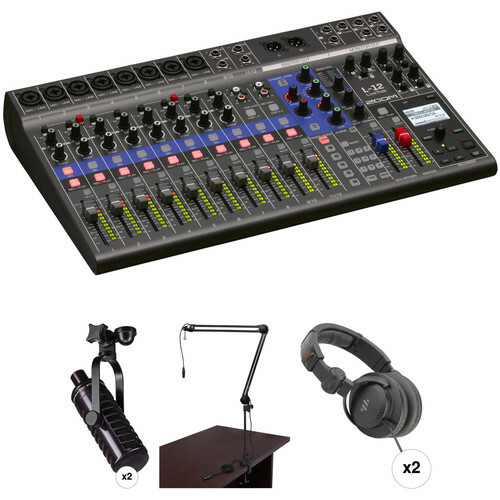 This Zoom LiveTrack L-12 Mixer/Recorder Podcast Kit with Two Rode Procaster Mics from B&H brings together the elements necessary to begin recording a 2-person podcast within minutes of opening the box. The MXL BCD-1 dynamic microphone features a cardioid pickup pattern that does a great job capturing speakers near the mic without picking up unwanted sounds further away. The included Auray two-section broadcast arms make positioning the mics a snap. The arms' integrated XLR cables plug right into the L-12 recorder, which features high-quality mic preamps and records to an SD card. The L-12 lets you create five individual headphone mixes, allowing you to plug in up to five sets of headphones, each with its own level control. Two pairs of Polsen HPC-A30 around-ear headphones are included for monitoring in comfort. When you're ready to invite more guests to your podcast, the LiveTrack L-12 accommodates up to eight microphones, which can all be recorded simultaneously to individual tracks. With easy-to-reach faders and knobs for on-the-fly adjustments of levels and effects, the system is fully standalone, but also ready to interface with a computer for live streaming or for more elaborate post-production work. The highly flexible Zoom LiveTrak L-12 is a 12-channel digital mixer and multi-track recorder, well suited for live performances, studio recording, band rehearsals, podcasts, and more. The compact mixer features 8 mono channels, each with combo mic/line XLR-1/4" inputs with high gain, low-noise microphone preamps, +48V phantom power, and a single compression knob, while the two stereo inputs offer dual 1/4" and RCA inputs. Channels 1-2 also offer Hi-Z inputs for connecting guitars and basses. All channels work with the on-board channel strip, which provides a low-cut filter, a 3-band EQ, a pan control, and a send FX for sending signal to the 16 built-in high-quality effects processor with a dedicated EFX Return channel. The main output utilizes balanced XLR outputs, while a stereo monitor send is available via two 1/4" outputs. Additionally, the Zoom LiveTrack L-12 offers five headphone outputs, each with the ability to set up customized mixes. Simply connect your headphones and adjust the levels to taste. There are nine snap-shot presets, which allow you instant recall of different setups and sessions. Box Dimensions (LxWxH) 21.25 x 13.0 x 4.5"